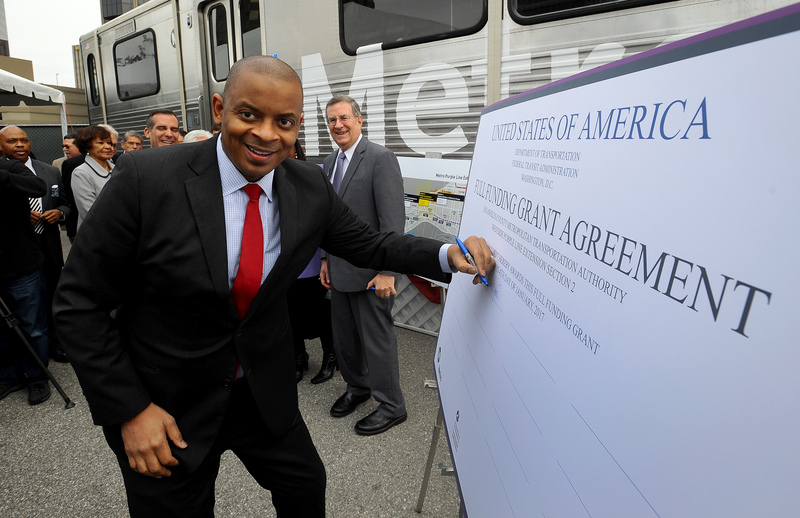 U.S. Transportation Secretary Anthony Foxx at the ceremonial signing Wednesday morning for the federal funding for the Purple Line project. Photo by Juan Ocampo for Metro. Looking east from the intersection of Wilshire Boulevard and Rodeo Drive in downtown Beverly Hills. The new subway station will be east of this intersection. Looking north toward the site of the subway extension’s Century City Station at Avenue of the Stars and Constellation Boulevard. Source: Google Maps. 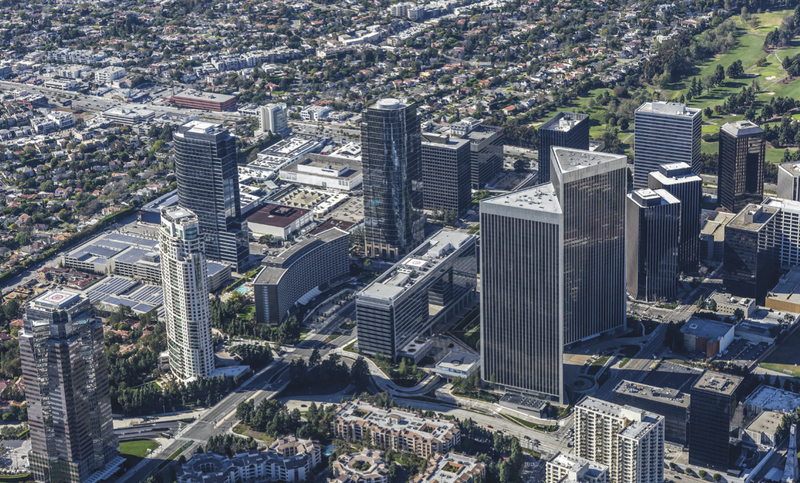 An aerial view of Century City; the intersection of Avenue of the Stars and Constellation Blvd. is up and left of the two triangle-shaped buildings. Credit: Metro. 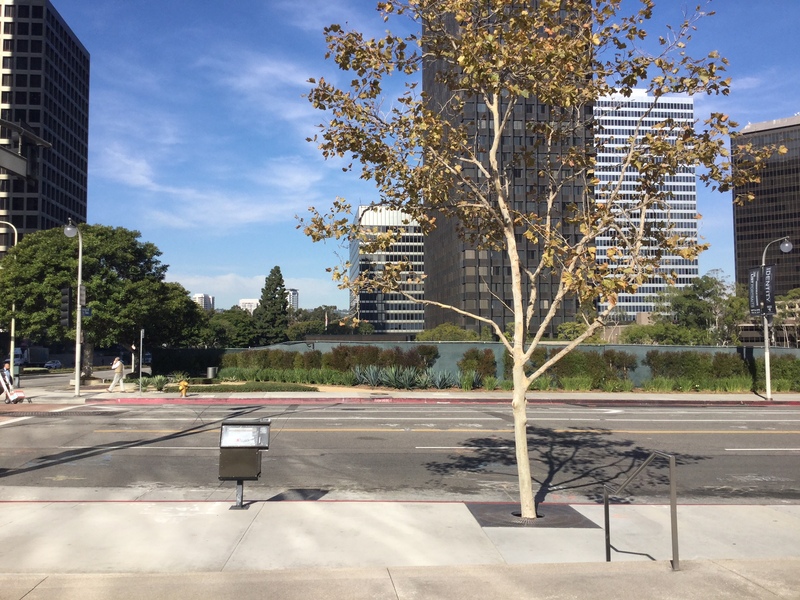 The view from ground level of the northeast corner of Ave. of the Stars and Constellation, approximate location of the Century City Station. A federal grant and loan totaling nearly $1.6 billion to help build the second phase of the Metro Purple Line Extension to downtown Beverly Hills and Century City was announced today by the U.S. Department of Transportation and Metro. 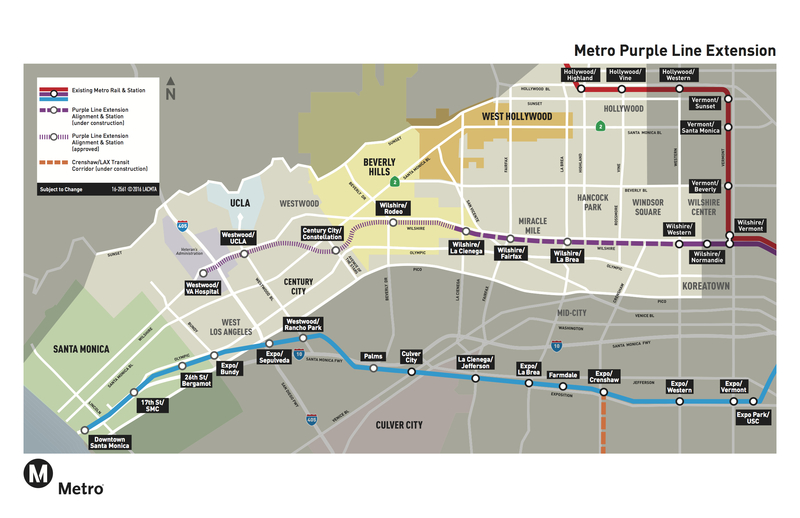 •The money is for the 2.6-mile second phase of the Purple Line Extension that will run between Wilshire/La Cienega Station and Century City. Two stations are included in the second section: Wilshire/Rodeo in downtown Beverly Hills and Century City at the corner of Avenue of the Stars and Constellation Boulevard. •The first section of the Purple Line Extension is under construction and will run for 3.9 miles between Wilshire/Western Station and Wilshire/La Cienga with stations at Wilshire/La Brea, Wilshire/Fairfax and Wilshire/La Cienega. It’s expected to take about 11 minutes for the subway to travel from its current terminus at Wilshire/Western to Century City Station. •The $1.187-billion federal grant for section two is from the Federal Transit Administration’s New Starts program, which helps local transit agencies build big capital projects. •The $307-million loan is from the U.S. DOT’s TIFIA program that provides low-interest loans to help build infrastructure projects. •The subway project is also receiving $169 million through the federal Congestion Mitigation and Air Quality program. •Funding for the second phase includes $747 million from the Measure R half-cent sales tax approved by L.A. County voters in 2008. Section two is expected to cost about $2.4 billion to build. Bottom line: without the Measure R funds, Metro would almost certainly not have received the federal funding. •Metro is now in the process of selecting a contractor to build the subway extension’s second phase. The agency plans to recommend a contractor to the Metro Board later this month. •Pre-construction activities — including utility work relocation — for the second phase are already underway. Major construction is planned to begin in 2018. •Completion of the second subway section is anticipated no later than 2026 per the agreement Metro has in place with the FTA. But Metro is aiming to finish the project by 2024 before a potential Summer Olympics in Los Angeles, said Metro CEO Phil Washington at the event Wednesday. •A third and final section will extend the subway to the Westwood/VA Hospital. Construction on this section — with funding from the recently approved Measure M sales tax — is planned to begin as early as 2019. •Construction of the Purple Line Extension will support over 25,000 jobs in the Southern California area during its construction, according to the Los Angeles County Economic Development Corporation. •The Purple Line Extension to the Westwood/VA Hospital station is forecast to generate about 49,300 daily weekday boardings at the seven new stations. There will be about 78,000 new daily trips on the full Metro Rail System as a result of opening this line. •A total of $3.1 billion in federal New Starts funding has now been secured for recent Metro transportation projects, including $1.25 billion for the first section of the subway and $670 million for the Regional Connector. These grants would not have been possible without Metro also having local funding from the Measure R sales tax. •Trains are expected to run every four minutes during peak hours on the Purple Line Extension and every 10 minutes during off-peak times. The Metro Board last month approved a contract for new subway vehicles to help support the line and the agency is also working on a project that will allow subway trains to turn around more quickly at Union Station, thereby increasing capacity on the line. •Over 300,000 people travel into the Westside every day for work from throughout the region. More than 100,000 trips also leave the area for outside destinations. The Purple Line extension will offer improved connectivity to the entire Metro Bus and Rail network, as well as transfers to municipal bus lines and other regional transportation services. People keep saying the Purple Line is happening because of political cooperation, but… really it's happening because of local voter support. Did PLE EIR include potential extension towards West LA and Santa Monica? It would be a shame to miss a huge job center just west of the WLA VA Hospital. Buses can serve those various centers quite well. Metro needs to think about having the Purple Line head north under Sepulveda Pass to Sherman Oaks. They should have tried to get the line to at least Bundy. The area around the VA/405 is horribly congested with Wilshire the only street in the area. Busses won’t be able to get in and out here. 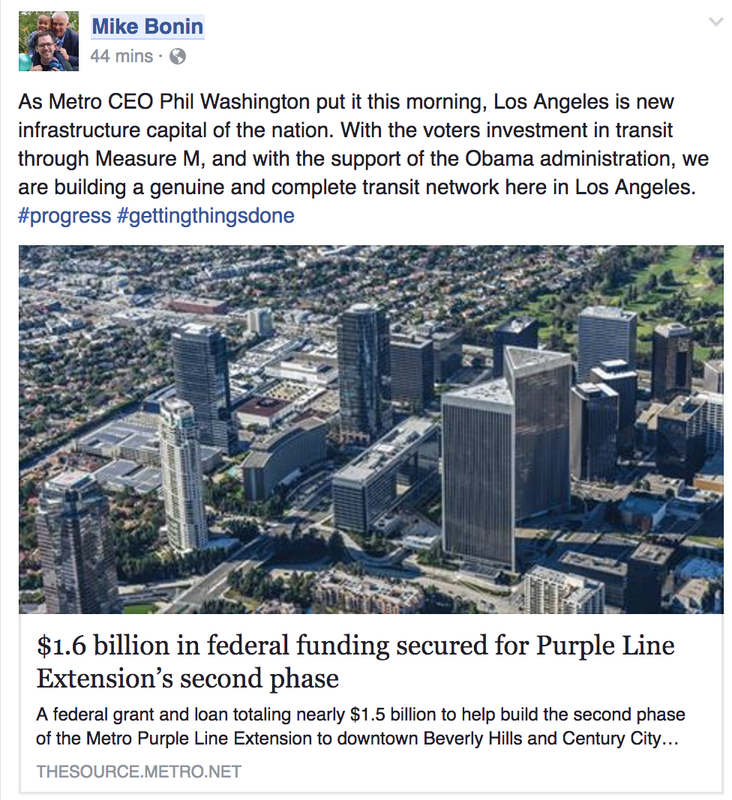 If the Purple Line reached Bundy, there would also be a solid connection with the BBB 14 between Expo and the Purple Line. Although this appear to be a very logical suggestion, an alternative already exists; Specifically, the Expo Line has a station that straddles Bundy. Although the Expo Line will always be slower that the Purple Line, it is a more than acceptable alternative. Getting down to the expo line makes it a non-starter. Will still be driving fme on WeHo to SaMo. .. No need for the purple line to do so….. The DEIR study included look at many alternatives — including extension to Santa Monica — but the Metro Board ultimately chose the alt between Wilshire/Western down Wilshire (mostly) to Westwood as the locally preferred alternative. Among the reasons were cost and ridership — there was only enough money to reach Westwood and the Expo Line to Santa Monica was already being planned and construction of its first phase underway. There hasn’t been a huge push by local officials to go west of Westwood and Measure M instead funded other Westside projects, including the Sepulveda Pass transit project between the SFV and LAX (in three phases), the Crenshaw North extension, the Lincoln Boulevard BRT and the Airport Metro Connector station at LAX. I disagree strongly. The Expo Line DOES NOT reach the sea, but stops 4 blocks short. We need rail lines to ALL beach cities. So far the Blue Line is the only one that comes close. Your distant predecessor, the Pacific Electric, had rail lines to all major beach cities in both Los Angeles and Orange Counties. I respectfully disagree. While neither the Expo Line or Blue Line come right up to the water’s edge, they’re both fairly close and I’m pretty sure the Expo Line is closer to the beach and the ocean than the Blue Line. I certainly do not feel like depositing passengers directly on the stand is anywhere near the top of transportation problems in our area. Don’t know about whether the Pacific Electric reached the south bay, but that last stop for the green line for the so called Redondo Beach station is a travesty. See if costco can get the naming rights for that station, becuz its no where near the beach. You bring up a good point. The station is actually within the boundaries of the city of Redondo Beach — which extend north and east of the beach part of the city. But water-wise, the station is probably closer to Manhattan Beach, which is directly west. On the upside, the Metro system map does show that the station is well inland and not right on the water. The Pacific Electric had a Redondo Beach via Del Rey line that branched off the Venice Short Line (now Metro 33/733) at Culver City along a diagonal route that is now Culver Blvd. to Playa Del Rey, and from there to Redondo Beach very close to the beach, Passenger service was terminated in 1940 but freight service continued into the 1940s. The PE also had a Redondo Beach line via Gardena and Torrance that branched off what is now the Blue Line at Watts/103rd Street. This line was a branch of the still-operating El Segundo line that once carried 747 fuselage sections made by Northrop, my former employer. Passenger service was terminated in 1940, but the Union Pacific still operates this line as far as Torrance. The PE also had a Santa Monica-Playa Del Rey local line that hugged to coast and connected with the Redondo Beach line, but with no through service. Service on this line terminated in 1936. Even the Santa Fe Railroad had a Redondo Beach line that branched off the Harbor Subdivision in El Segundo. Per Google Earth, most of the right-of-way is still available. Perhaps this route can be used to extend the Crenshaw line to Redondo Beach. I didn’t realize that. #ThingsILearnFromReadingTheComments. It’s funny — in Google Maps it shows pretty much all the station within the city boundaries, for whatever that may be worth. Line 102 – Serves Redondo Beach Pier, Civic Center, Redondo Union High School, Beach Cities Health District, South Bay Galleria, aerospace companies in North Redondo and Redondo Beach Green Line station. Operates 6:00am-8:00pm. Line 109 – Serves Riviera Village, Pier Avenue in Hermosa Beach, Downtown Manhattan Beach, Downtown El Segundo, Douglas Green Line Station, The Pointe, Plaza El Segundo, Aviation/LAX Green Line station, and the LAX Bus Center. Operates 6:00am-10:00pm. Line 102 serves mostly commercial, civic, industrial, and other facilities, while Line 109 is the “beach line” serving the South Bay beach cities. Please note that the current Green Line timetable does not show either of these connections. I assume that Metro inter-agency transfers are accepted on these two lines. It is an enormous missed opportunity that this line is not engineered to also serve Beverly Center and Cedars. Hospitals are great ridership generators. And by doing this the approach from Rodeo to Century City might not have had to pass under Beverly Hills High School. FWIW, it’s .7-miles from Wilshire/La Cienega Station to Beverly Center and .8 miles to Cedars Sinai. Such a routing would have taken the subway off Wilshire — and also routed the project under more private properties as it swings back and forth between Wilshire and other stations. That’s certainly not to say that’s impossible but it would likely have raised the cost and this is a project that only had so much funding. This is where free shuttle trolly service should b provided to those with a valid TAP card. Congrats, Metro Team! <3 <3 This is amazing to finally hear! Excited to see what all the future will bring! Although the Expo Line does reach Santa Monica, too bad it terminates 4 blocks from the sea. Any thought about Big Blue Bus providing free trolley service to those with valid Metro TAP cards between the Expo Line terminal and the beach? Our “Buddies in New York” already have subway lines to Coney Island (D and F Trains) and to Rockaway Park and Far Rockaway (A Trains). Although Metro could not do this, the New York base MetroCard fare is $2.75 plus $1.00 for card purchase. However, you can purchase single subway ride tickets for $3.00, and there are numerous free-transfers between the various subway lines. The outer-reaches of the A, D, and F lines are elevated in parts of Brooklyn. I can even imagine an elevated extension of the Purple Line to Venice and and even to Redondo Beach, thus serving several intermediary beach cities. In the interim, could a BRT Service be provided between the Expo Line Terminal and Redondo Beach along SR 1 and Vista Del Mar and other streets to serve Marina Del Rey and the intermediary beach cities? LA DOT already has a Route 438 between Imperial Highway and Redondo Beach that could be extended north to the Expo Line Santa Monica Terminal and converted to a 7 day service. This would require looping around Marina Del Rey as LA DOT Route 437 already does. Ultimately, a bridge across the Marina Del Rey channel, similar to the SR 1 bridge near Seal Beach, could be built, but this could serve both the BRT and local automobile traffic. As shown in Figure U of the 2009 Long Range Transportation Plan (https://media.metro.net/projects_studies/images/final-2009-LRTP.pdf) the second phase of this Extension would bring the Green Line all the way to the southern terminus of the I-110 Transitway. How does 4 blocks make a difference in ridership for the Expo Line?? It does in fact reach the sea, as a simple 4 block walk is by no means a deal breaker for the use of this alternative. Extending this line the extra 4 blocks would simply make no sense. Also, people going into Downtown Santa Monica simply in fact go to that said destination, not just the beach. 4 blocks may be too much for those with impaired mobility such as yours truly. That I way I suggested a free trolley service for those with a valid TAP card. Like many other projects, it’s getting a big boost from Measure M.
Random question, with the federal grant does that mean that that grant money amount can now be used elsewhere? I know Measure M mentioned that additional money could accelerate projects and then perhaps speed them up. The grants are great but they don’t actually free up any money for other projects — the federal money helps fill funding gaps. As for project acceleration, the hope there is to use Measure M money plus possibly private funds to build projects sooner than otherwise scheduled. We need the M money to attract the private dollars and Metro has received some proposals which are being reviewed. So we’ll see. The first big step was getting M approved – and that will help get the subway to Westwood a decade earlier than planned under Measure R. Stay tuned! The travel time advantages should be highlighted more, because of its likely effects on traffic speeds as a new equilibrium is reached between road and rail. The new subway will reduce travel time between Wilshire/Western and Century City to 11 minutes, and could attract enough new users to increase traffic speeds on Wilshire and the 10. This equilibrium effect was found in Sydney when train times were increased, that road travel times were increased by a similar amount because just enough commuters changed from rail to road until the travel times were in equilibrium. Given that the folks at Metro have decided that the Purple Line will have its terminus at the VA Hospital, has any thought been given to designing it in such a way that it has two entrances, with one serving the VA and the other the Brentwood/West LA community through an exit on San Vicente? I know the distance is quite far but if exits were placed at each end of the station, they could significantly increase the usage and ridership at that station. 4 minutes for the purple line once completed? SHOULD be 2 maybe 3……………. Is the MTA planning on creating new bus lines to connect some of these isolated stations with the east-west bus lines north and south of the stations? I don’t believe the PLE stations are isolated and there is, of course, a bus lane on parts of Wilshire that are in the city of L.A. As for other streets, I’m unaware of any plans at this time — but keep in mind that Metro has to work with the cities that control roads before implementing a bus lane. As for the subway, I think the most important bus connections will be on the major north-south streets near the stations, i.e. La Brea, Fairfax, La Cienega, Westwood. This has been in the works for a VERY long time. Glad to see it finally happening! Thanks to Shelia and all the hard working people who are working so hard to make this come to pass. I love the Santa Monica train line. The Subway to the Sea should provide beach towels and a place to shower off, not to mention a rock polisher and a way to organize your shells! I live in Huntington Beach. Hence my advocacy for a new Southern California Transportation Authority (SCTA) similar to the original concept for the SCRTD, but now including Ventura County. The current county-run transit systems such as OCTA, Omnitrans, RTA, and VCTA could still operate local transit systems, but the SCTA would operate all LA County and, what is now sorely missing, an extensive inter-county transit system including both bus and rail. This is how the New York MTA (http://www.mta.info/) is organized and it should be the same here. I also advocate that the West Santa Ana (former PE Santa Ana) line ultimately be extended to Santa and Irvine, with a branch along the UP line from Santa Ana to the Huntington Beach transit center. This UP branch line once had PE service. @ Frank Mastroly you’re the only one here who’s against the line going under the high school………. I never said such a thing. Actually, a well-designed project should not impact surface structures. Except for the noise coming up from ventilation shafts folks won’t even know there is a subway beneath their feet, i suspect that these shafts can be designed to minimize the noise. Sorry if this is a repeat, but as this was being written it had not yet been posted. Another reviewer had the same problem. West Hollywood to Santa Monica is still PITA even with all these additions. This is easily one of the most if not THE most important rail extensions LA county has seen for almost two decades and its great that its finally (mostly) coming to fruition (although If it weren’t for that darn Ross dress for less explosion and subsequent congressional pandering to westside NIMBY interests we might already have an actual subway to the sea.) However, I fear that ending the line at VA hospital not only sets up a rather awkward transfer point for going further west on this corridor, the design of it also doesn’t work well for a terminus or park-and ride-hub the way other stations like North Hollywood do and is not very pedestrian friendly. Extending this line slightly further west to another station at Barrington for example would at least centre it in a dense residential and business area and would would likely be a substantial boost to ridership. Or, even better, would be extending it to Bundy with a station there and then turning south to terminate at the existing Expo/Bundy station which would at least allow a 2 seat ride from points west to points east anywhere along the purple line corridor or vice versa. The West LA area certainly has the density to support at least couple more stations further west and/or south so I don’t think that’s an issue here. Metro should seriously consider this idea in the long term as it would be an acceptable alternative to the original plan (going all the way to Santa Monica) if that really somehow can’t ever happen. This line is extremely important and it’s great that most of it is finally coming to fruition, but it seems that having the line terminate at the VA hospital will result in a rather awkward transfer point to go further west and the area is not very pedestrian friendly. Also, there doesn’t seem to be any plan for a park-and-ride lot like there is at the end of the red line in North Hollywood which, as anyone can tell, is quite full much of the time and probably accounts for a substantial chunk of that station’s ridership. A station entrance at Wilshire/Federal (San Vicente) could help this situation somewhat. Perhaps some consideration should be made, provided the funding, to extend the line slightly further west to an additional stop at Barrington in order to center it in that much denser and pedestrian oriented area. Or, extend the line to Bundy with a stop, then turn the line south and terminate it at the Expo/Bundy stop to provide a two seat rail connection from anywhere on the purple line to points west like Santa Monica. Obviously it’s unfortunate that this line will probably not be extended “to the sea” (DTSM) like the previous plans called for, but this could be an adequate replacement given the truncated plans due to limited funding. Another possibility; if the purple line is merged with the Sepulveda pass corridor rail line, perhaps a wye junction could connect trains to this route going north to Sylmar and south to LAX and thus a two seat connection would still be possible via Expo/Sepulveda. Whoops, sorry for the somewhat double post. Thought the previous comment had been rejected. My bad. If LA wins the bid for the games, can the third and final section of the subway be completed by the start of the 2024 Olympics with a start date of early 2019, Is there any way that metro can move up the start date? We’ll have to see. The big things that have to get done are securing a federal grant/loan and then getting the project out to bid in order to hire a contractor.